The Depot is housed in an old train freight building on the Frisco walking and biking trail near the corner of West and Dickson Streets. Built in the early 1900’s, the building had fallen into disrepair and was in need of a facelift. After a year of demolition and remodeling, it is claiming its place as one of Fayetteville’s historic landmarks once again. From the original, uniquely designed wood floors to the spacious outdoor decks, the Depot offers a comfortable, lived-in atmosphere while maintaining its singular character. 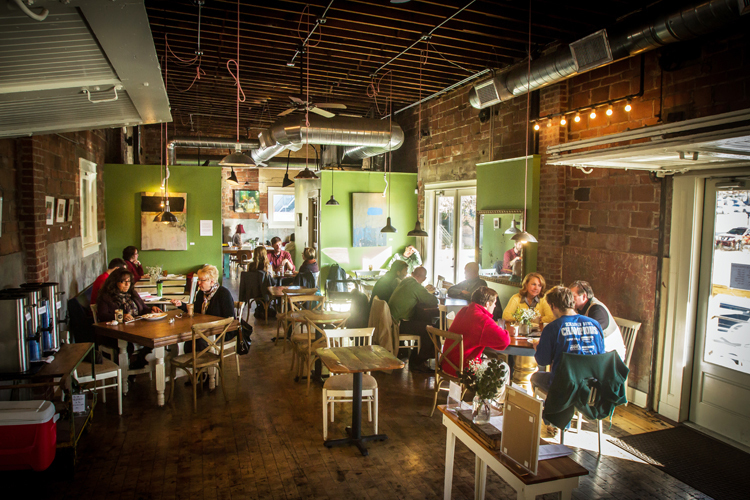 Its central location makes it a convenient gathering place for Fayetteville’s diverse community and its visitors. It offers special menu options on request for group meetings, music and art events, and small parties and receptions. Click here to view historic and construction photos. Serving breakfast and brunch until 3pm.